At the Mnazi Moja Grounds at the crossroads of Bibi Titi and Uhuru streets in Dar es Salaam there is a large banner warning Tanzanians against being taken into troubled waters by power-hungry individuals. Wise advice as the plethora of candidates for Tanzania’s presidential and parliamentary elections compete for the right to stand for office. There has been much drama during the last three months as Tanzania’s first multi-party elections approach. They are due to take place on October 22 in Zanzibar and October 29 on the mainland. The final list of candidates was not due to be approved by a very busy National Electoral Commission until August 28, after this issue of TA has gone to press, but the main pattern is now clear. In the presidential list only those candidates who have selected vice-presidential running mates (who have to be from Zanzibar if the presidential candidate is from the mainland) are being allowed to stand. In the race for parliament, competition is fierce. Thousands of people in 13 registered parties are jockeying for selection. Three more parties applied very recently for registration. The principal opposition to the ruling CCM party has been, since the dramatic exit from government on February 24 of former Deputy Prime Minister Augustine Mrema, the NATIONAL CONVENTION FOR CONSTRUCTION AND REFORM (NCCR-Mageuzi) – see TA No. 51. Since then Mr. Mrema has been indefatigable in touring the nation and attracting huge crowds in what will be by far the longest election campaign of them all. However, although tens of thousands of people have apparently joined the NCCR-Mageuzi party, it still seems like a one-man show compared with the mighty CCM with its branches and cells in every town and village in the land. Thus, much, more than the normal attention was directed to the selection of NCCR’ s vice-presidential running mate. The answer came as a complete surprise, not least to the candidate himself, on Monday August 7, when it was announced that the NCCR had unanimously chosen the long-time British resident and well known Professor A M Babu as its candidate. By Thursday he was in Tanzania and on Friday was addressing a large NCCR rally in Dar es Salaam. Later he did the same in Kigoma. But then some lawyers pointed out that, under Article 47 of the Constitution of the United Republic, a person can only stand for an elected seat in parliament or for the Vice Presidency if he/she is eligible to vote by reason of having lived in the country for five consecutive years before the election. Babu has been away from Tanzania for most of the last 16 years. But, as Constitutional Lawyer J T Mwaikusa told TA, this legal requirement may not apply because it was intended to bar opportunists who had been away for political reasons. He pointed out that Babu organised a seminar in Zanzibar last year and had never been prevented from returning to the country. But Babu then also faced another problem. His selection apparently did not prove popular with the CUF party in Zanzibar with which Mr Mrema was hoping to make an electoral pact. The matter was not resolved as this issue of TA went to press. Furthermore, neither the CHADEMA Party nor the CUF Party (details below) had nominated candidates for the presidency and seemed likely to support Mr. Mrema. They had agreed not to oppose each other in parliamentary constituencies. Smaller parties wished to fight on alone. For the Chama cha Mapinduzi (CCM) the die was finally cast at a crowded Extraordinary National Conference of the Party at Dodoma on Saturday July 22. After months of drama as more and more people put themselves up as candidates, there had been seventeen persons for the party to choose from. But after preliminary selections by the party hierarchy, the list had been reduced to six. Then, on June 17 the party’s National Executive Committee reduced the list to three. The mantle finally fell on the shoulders of former Foreign Minister Benjamin Mkapa – but only just – and apparently because of a switch of votes to him by Zanzibari delegates. The party’s Youth Wing, having heard the results of the first ballot in Dodoma, had begun celebrating when the candidate they favoured, Lt Col Jakaya Kikwete, came out top. But according to the rules, as he had not achieved 50% of the votes, there had to be another ballot. Prime Minister Msuya had come a poor third in the first ballot. Six months ago few would have expected Mr Mkapa to gain the candidacy and some observers have expressed the opinion that CCM would have done better to choose a more charismatic figure from a younger generation like Finance Minister Jakaya Kikwete or Lands Minister Edward Lowassa to cope with the formidable opposition candidate Augustine Mrema. But all agreed that Mr Mkapa brought to the candidature one element considered vital in an election in which corruption is the main issue – his total integrity. And he has one other great asset; Mwalimu Nyerere’s determination to campaign vigorously in his support. 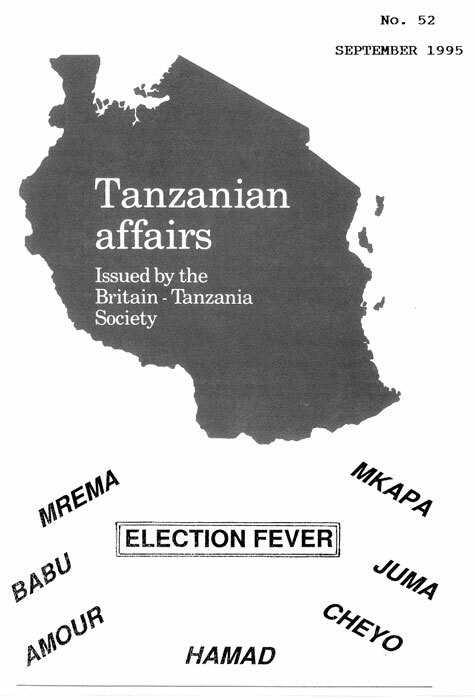 The CUF, formed on May 28 1992 as a merger between a pressure group for democratisation in Zanzibar – KAMAHURU – and a mainland human rights organisation – the CIVIC MOVEMENT. which is the third most important party because of its considerable strength in Zanzibar (particularly Pemba) has been plagued with problems because of differences between its former mainland-based Chairman and its Zanzibar Vice-Chairman, former Chief Minister Seif Sharrif Hamad. It has finally elected a new national chairman. He is former Lands, Housing and Urban Development Minister Musobi Mageni Musobi who was elected by 268 votes out of 383 delegates. Hamad was elected National Vice-Chairman by 97% of the votes and was also chosen as the party’s candidate for the Presidency of Zanzibar. WHAT ARE THE POLICIES OF THE PARTIES? Mr Mkapa was asked the other day how socialist he is. He replied: ‘As a staunch CCM member I am as socialist as the CCM is’. But this reply begs the question. The extent of socialist philosophy remaining in the CCM is not easy to determine. CCM’s President Mwinyi, with IMF and World Bank support, has been conducting a free market/privatisation policy for several years. He describes this policy as pragmatism. CCM’s Mwalimu Nyerere, whose influence in the party is still very great hankers after a return to socialism and the spirit of self-reliance enunciated in the Arusha Declaration. At a May Day rally of 20,000 people in Mbeya (he can still attract the crowds) he described the privatisation of parastatals, which President Mwinyi has been pursuing vigorously, as “naked plunder of the toiling masses”. “How can a responsible government sell off profit-making public corporations like the Tanzania cigarette Company?” he asked. CCM seemed likely to have some difficulty in agreeing on a party manifesto. In the main opposition parties corruption is the issue. In ideological terms Mrema has insisted that he is a a man of the people; it can be assumed therefore that he is ‘left of centre’. So clearly is the one-time (in his youth) Marxist Babu but he has modified his views over the years and now accepts some elements of the free market. NCCR may thus have less difficulty in presenting an agreed manifesto. Another party which might achieve some significant support is John Cheyo’s UDP (see below) because it is clearly in favour of the free-market and could be described as Thatcherite in its policies. In Zanzibar it seemed that political history and local nationalisms are of greater importance than ideological differences between CCM and CUF. In view of the serious problems facing the nation several leaders including Mwalimu Nyerere have proposed a Government of National Unity (GNU) after the elections. If the results are close this could be the ultimate outcome. The results of both the Union and Zanzibar Presidential elections are uncertain as this issue of TA goes to press. 85% of the 10 million eligible voters live in 8,000 villages in rural areas. CCM, by reason of its superior organisational abilities, the respect in which it is still held in much of the countryside, the paucity of suitable NCCR candidates and the sophistication of the Tanzanian electorate, seems likely to obtain a comfortable win in Parliamentary seats on the mainland. It is perhaps significant that virtually none of the established figures in the CCM (apart from Mr. Mrema) have changed sides to the opposition. An indication of the strength of the NCCR however has been the results of the only true tests of voter opinion since Augustine Mrema gave some backbone to the opposition. There have been five local by-elections. The first was for a seat on the Dar es Salaam City Counci I on June 5. The NCCR-Mageuz i candidate, Dr. Masumbuko Lamwai, a lawyer, gained a substantial victory by 3,356 votes to 1,899 for the CCM with 270 votes for the CUF candidate. There followed four byelections for councils in Moshi Rural, a Mrema stronghold. NCCR-Mageuzi candidates took every seat with an average of 82.8% of all votes cast. The record of the CCM government since multi-partyism was introduced has not been totally good. For example, the Kigoma parliamentary by-election result in 1994 was later declared nul and void because of CCM misdemeanours (TA No 50). Again, in March this year, the Dar es Salaam Court ruled that the civic elections in Kariakoo Ward won by CCM City Mayor Kitwana Kondo in October 1994 had also not been free and fair. The opposition candidate, who was then in the UDP party but has since followed many others in joining NCCR-Mageuzi, was Mr Abbas Mtemvu, son of the Mtemvu who challenged President Nyerere for the presidency in the 1960’s. In a 100- page judgement the magistrate said that the speeches given by President Mwinyi and Zanzibar President Amour had been intimidating and had ‘lowered the esteem’ of Mr Mtemvu. They had portrayed the opposition in a ‘destructive manner in insinuating that Mr Mtemvu was someone who could usher the country into a Rwanda-like situation’. Mr Kondo was required to pay costs and has since lost his position as Mayor. There have also been frequent cases of disruption of meetings of the CUF in Zanzibar and some cases of trouble at NCCR meetings on the mainland. The worst of the latter was in Moshi in late July when the Police used teargas against Mr Mrema’s motorcade and he had to be taken to hospital. Later, leaders of the 13 registered opposition parties strongly condemned the action and a group of women presented a petition on the subject to the Danish Embassy in Dar es Salaam. The Danes are coordinating donor assistance for the elections. CCM pointed out, correctly, that Mr Mrema had held numerous public meetings around the country without difficulty but President Mwinyi promised to tighten up protection for opposition leaders. CCM dominance of the radio continues but Minister of Information Philip Marmo said that things would change as soon as the electoral campaign officially began on August 28. The Electoral Commission has improved CCM chances by creating 52 new parliamentary seats. In the last parliament there were 255 seats including seats for 75 National members – 15 Presidential nominations, 15 from mass organisations, 15 women, 5 elected by the Zanzibar House of Assembly and 25 Regional Commissioners. These seats now disappear. Many of the CCM stalwarts who were sitting as National members and have been desperately looking for seats will now be able to find one. Former Prime Minister John Malecela is one who has found a possible home in the new constituency of Mtera. According to the ‘Business Times’ (with tongue in cheek) rumour had it that two Masaai CCM MP’s fighting for one seat, and remaining true to their warrior ancestry, were going round with folded spears in their briefcases! When Masailand was divided into two constituencies they were said to have jumped into the air and done a three-minute Masaai jig before locking themselves in brotherly embrace! There are to be no extra seats in Zanzibar. There are 29 in Unguja and 21 in Pemba. Selection of CCM candidates for parliamentary seats was in full swing as this issue of TA went to press. Selection was to be finalised by August 28. The National Electoral Commission is showing efficiency and ingenuity in coping with these first multi-party elections. It is establishing 40,522 registration centres and intends to try and ensure a free and fair election. Following a minor disturbance at the recent Dar es Salaam local by-election a Bill was rushed through Parliament in August to make provision for all votes to be counted at polling stations. There will be many observers. The Department of Political Science and Public Administration of the University of Dar es Salaam has set up a ‘Tanzania Electoral Monitoring Committee’ under the chairmanship of Prof. R S Mukandala which hopes to have a representative at every one of the 10,000 polling stations. Foreign election observers are likely to be in Tanzania in strength. The Commonwealth, the UN, the EU and others are hoping to send observers. In an effort to resolve difficulties which had arisen following the passage of the 11th Amendment to the Constitution (TA No 51) a 12th Amendment, approved by Parliament on May 4, created ‘Four Top Union Leader’ positions – union President, Union vice-President, Zanzibar President and Union Prime Minister, (but not, as originally proposed, the Zanzibar Chief Minister as it was feared that the Isles could have reached a position of dominance) to ‘be responsible for the welfare, security and development programmes in the united Republic’. This presumably means that these persons represent the ultimate leadership of the United Republic. WHO WILL PAY FOR THE ELECTIONS? Much of the considerable cost of the elections will be covered by a pledge of $15 million from Denmark, Finland, the Netherlands, Norway, Sweden and the EC and $ 1 million from Canada. The government intends to spend some Shs 22 billion on the elections; it will subsidise political parties by giving each party Shs 5 million; for each parliamentary candidate nominated there will be Shs 1 million and for each ward candidate in civic elections Shs 30,000. BENJAMIN WILLIAM MKAPA (57) CCM Presidential Candidate. Mr Mkapa majored in English at Makerere University in 1962 and later studied journalism in America. He has been Managing Editor of three newspapers including the ‘Daily News’, Press Secretary to the President, Director of the Tanzania News Agency, High Commissioner in Nigeria and Canada, twice Foreign Minister and, since May 1992, Minister of Higher Education, Science and Technology. He is an MP in Mtwara Region. His first job was District Officer in 1962. Mkapa brings to the presidential race formidable experience of diplomacy and government but has never occupied an economic or financial post. In interviews he stresses that he is a creature of the CCM. He has a reputation as a reader and thinker but lists his hobby as ‘sauna’. He is likely to conduct a dignified campaign. He is reputed to say what he means; is hard-working, approachable and a good speaker in both English and Swahili. He brings one great asset to the CCM campaign – his totally clean record – but some observers wonder, if he is elected, how he will be able to get rid of colleagues who might be found to be corrupt when he has been serving in the same party and government with them. Asked in a recent interview in the ‘Business Times’ how he would fight corruption his reply was: ‘It would not be prudent for me to spell it out in an interview. There will be a CCM manifesto which I am certain will deal with this question … but there would be no length to which I would not go to root it out’. The ‘Business Times’ went on to express uncertainty as to whether his election would promise peace and tranquillity or indecision and immobility. Recalling British politician Enock Powell’s speech in the House of Commons during the time of the Falkland’s war about the Iron Lady, Margaret Thatcher – “This House and the World will learn of what metal she is made”, Tanzanian House Speaker Pius Msekwa said on July 29: “Mr Mkapa is made of ferrous material of the highest quality and of exceptional tensile strength … during the next month or two the opposition parties and indeed the rest of our country will learn of what metal Benjamin Mkapa is made”. Mr Mkapa is a refreshingly honest politician. On learning of the arrival of Babu in the opposition camp he said: “This has obviously strengthened the opposition. We all know Babu as a good politician, a good economist and a prominent journalist ..•.. ” Such praise of one politician by another who is opposing him is so rare that it is likely to be remembered. Dr. Juma, is a Veterinarian by profession and was trained in Moscow, Edinburgh and Reading. After service as a Livestock Officer and then Principal Secretary he became an MP and has been Chief Minister of Zanzibar since 1988. He is regarded as a tough operator – most politicians in Zanzibar have to be – who does not mince his words in public. Dr. Amour originally became President of Zanzibar in 1990 and has shown himself to be capable, determined and forceful as leader but he faces very strong opposition from the CUF party in an election in which there could be some intimidation. Mr Mrema started his career as a teacher and then became an officer in the State Security Service for which he was trained in Eastern Europe. He was serving in Shinyanga when the famous murders took place which resulted in the resignation of the then Home Affairs Minister, Mr Ali Hassan Mwinyi. His opponent when he stood as MP for Moshi Rural in 1985 subsequently petitioned the Court to have the election annulled and won his case. It was only on appeal that Mr Mrema was able to retain his seat. He then became a powerful advocate for the cause of coffee farmers in Moshi. After his re-election in 1990 he was appointed by President Mwinyi as Minister of Home Affairs where he rapidly built up nationwide popularity. He was widely regarded as the most popular member of the Mwinyi cabinet because of his unrelenting investigations into cases of corruption and injustice. His sacking by the President in February this year over the Chavda case (TA No 51) enhanced his reputation as a campaigner against corruption but some felt that he should have resigned earlier when, for example, in 1994, he discovered a gold smuggling racket in Zanzibar but was allegedly prevented from taking action and handed back the gold after ‘pressure from above’. Most observers believe Mrema to be a skilled operator. He is a populist to the core and has been attracting huge crowds whenever he speaks. His campaign against the ill-treatment of wives by their husbands has made him popular amongst women. He knows how to keep his message simple so that people can understand. He was the only politician to fight tax evasion before it became a national scandal. Asked in an interview by the ‘East African’ about accusations that he had taken arbitrary actions when he was Minister of Home Affairs and whether he would abide by the rule of law if he became president, he said that he had had to take short cuts and make probes into other ministries to solve peoples’ problems. He promised to abide by the rule of law once he had established government machinery which was accountable and was responsive to peoples needs. He would appoint a Minister to be responsible for recovering property lost over the years through corruption. Asked whether he had a tendency towards dictatorship he replied: ‘In the new era of liberalised politics there is no room for a dictator as President as there will be checks and balances like the new law allowing for impeachment of a president’ . Asked about allegations that he owned several houses he said that he had one house in Marangu; he had taken a bank loan to build another house in Dodoma which he had not been able to finish. He was presently living in a rented house. His car had been provided in his capacity as an MP. He has been variously described as a loose cannon, an opportunist, an unguided missile. On one occasion he was said to have had the excellent idea of confiscating the chairs of bureaucrats who spent an inordinate amount of time outside their offices! If he is elected as President life in Tanzania will not be dull. How Mr. Mrema would cope with a parliament in the hands of another party remains to be seen. Professor Babu was trained first in journalism and worked in the civil service in Zanzibar before entering radical leftwing politics leading the UMMA party in the 1960’s. He was very active at the time of the Zanzibar revolution and served as cabinet minister several times in the Isles and mainland governments. He was sentenced to death and imprisoned at one stage and then left Tanzania for university lecturing in America and established his reputation as an academic. He later settled in London as a successful freelance journalist. He brings to the NCCR camp intellectual weight, ministerial experience, charm and considerable fame. In an interview on June 2 in the ‘Business Times’ Babu modified some of his more radical views and said that he was now reconciled to the coexistence of free enterprise and collective ownership. He abhorred the IMF and World Bank structural adjustment programmes. Socialism was not dead at all. What was destroyed in the soviet Union was not socialism. Socialism could be, as in China, a transforming strategy, using capitalism in order to develop new socialism within a pluralistic context. On the Union issue he said that what was needed was a treaty of cooperation between Tanganyika and Zanzibar. On arrival in Dar es Salaam to hold the NCCR banner he said that it was Mwalimu Nyerere’s partisanship (in favour of CCM) that had persuaded him to take part in the election. Mr Hamad is the Vice-chairman and effective leader of the CUF and its very charismatic candidate for president of Zanzibar. He worked with Ali Hassan Mwinyi when the latter was Zanzibar President to defuse secessionist feeling. He pressed ahead when Chief Minister of Zanzibar from 1984 to 1989 with liberalization but was said to have alienated Zanzibar CCM traditionalists. He was dismissed as Chief Minister in 1988 and expelled from CCM. He was detained and charged with taking away confidential documents but the case was dropped. He favours the three-government structure for Tanzania which is strongly opposed by Nyerere. He proposes that compensation should be paid to those whose land was nationalised. Political activists have been either filled with admiration or driven to exasperation as they have witnessed the way in which Mwalimu Nyerere, who officially retired eight years ago, has been so hyperactive in the process of choosing the CCM presidential candidate. First he wrote a book highly critical of the present leadership and of its corruption (TA No 50); then he defined clearly the qualities needed by any presidential candidate – commitment to the Union with Zanzibar and hence continuation of the present two government system, complete integrity and acceptance of the rule of law; then he made a number of well-timed speeches; finally, he managed to get himself invited to most of the significant meetings of the CCM leadership and membership when the issue was debated. Originally he was believed to have favoured OAU Secretary-General Salim Salim as CCM presidential candidate but when Salim withdrew, Mwalimu Nyerere took a prominent part in ensuring that 14 other potential candidates including two former Prime Ministers (Malecela and Warioba) either retired from the fray or were eliminated as they did not comply with his leadership criteria. At the Dodoma selection conference Mwalimu, in an impassioned speech, stressed the importance of the Party selecting a candidate free from tribalism, corruption and religious bias. In the end it was believed to be his choice – Benjamin Mkapa – who got the nomination. After a surprise meeting between Nyerere and Mrema Nyerere was quoted as saying that he would ‘not allow the country to go to the dogs’. Both Mwalimu and Mkapa deny the above widely held interpretation of events. Mr Mkapa needs to establish himself as his own man. Meanwhile, Mwalimu Nyerere’s son, Charles Makongoro Nyerere, has defected from the CCM, joined NCCR and is to be found accompanying Mrema on his nationwide campaign trips. The son was quoted as saying that his father still thought that Tanzania belonged to him rather than to the people. UNITED DEMOCRATIC PARTY (UDP) is a creation of Presidential candidate John Cheyo. Cheyo was recommended by his local CCM branch in 1990 to be its candidate for parliament but was turned down by the leadership apparently because of his capitalist views. In last year’s civic elections UDP won 13 seats in Bariadi to CCM’s 13 and the ten which went to other parties. He advocates three governments, opposes Ujamaa villages; states that people, not the state should own land. He favours removal of restrictions on investment and that Tanzania should peg its Shilling to gold to control inflation. Running mate – Soud M Nassoro from Zanzibar. TANZANIA DEMOCRATIC ALLIANCE (TDA). Leader Oscar Kambona (67) one time close collaborator of Julius Nyerere who held many cabinet positions but then left the country for exile in Britain for more than 20 years. His party has entered into an alliance with the UNION FOR MULTI-PARTY DEMOCRACY (PODEMO) a splinter group of the UMD. The leader is Christopher Kasanga Tumbo. CHAMA CHA DEMOKRASIA NA MAENDELEO (CHADEMA) under the leadership of former Finance Minister Edwin Mtei was considered the leading opposition party until it was eclipsed by the NCCR. Its vice-presidential candidate in Zanzibar is Abeid Abdullah Abeid (42). UNION FOR MULTI-PARTY DEMOCRACY (UMD). The leader is Chief Abdullah Fundikira (76) but the party is riven by dissension. NATIONAL RECONSTRUCTION ALLIANCE (NRA) led by Mr Abubakar Olutu, a Muslim from Kilimanjaro. The party gained massive pUblicity when former Finance Minister Kighoma Malima joined it and called for greater Muslim representation in the higher organs of the state (see Obituaries). Other small parties include the NATIONAL LEAGUE FOR DEMOCRACY (NLD) – Chairman and Presidential candidate Emmanuel Makaidi; the NATIONAL ALLIANCE FOR MASS ADVANCEMENT (NAMA); the UNITED PEOPLES CONGRESS (UPC); the POPULAR NATIONAL PARTY (PONA); the TANZANIA LABOUR PARTY (TLP); the TANZANIAN PEOPLES PARTY (TPP)’ and, the SOCIAL DEMOCRATIC PARTY. This lengthy report on the elections has been written in the midst of almost daily changes in the political scene in Tanzania and by the time it reaches readers things may have changed further in unexpected ways – Editor (with much help from others which is much appreciated). The STANDARD BANK INVESTMENT CORPORATION OF SOUTH AFRICA (STANBIC) took over the collapsed Meridien BIAO Bank on June 2 and customers were assured that all their deposits would be safe and due interest would be paid. STANBIC said it would retain most of the 150 members of staff at the three branches in Dar es Salaam and Arusha but not open additional branches. The total losses incurred – $34 million – are being covered by Ministry of Finance Bonds ($18m), the Central Bank ($10m) and STANBIC ($6m) – The Dar es Salaam Guardian (May 3) and Daily News (July 17). PARASTATAL REFORM was going well the Reform Commission’s Chairman Mr George Mbowe said recently. 95 firms had been divested in the last two years and by the end of this year 145 firms would have been either partly or wholly sold, liquidated or subjected to a performance contract. In some cases production had picked up from zero to 75% of capacity. Very positive results were being seen in the leather, beer, hotel and pharmaceutical industries – Daily News. The WORLD BANK’S IDA has granted an additional credit of $10.9 million for financial sector reforms and for the restructuring, privatisation and downsizing of three banks including the Bank of Tanzania and for the development of capital markets – World Bank News. The World Bank Group’s INTERNATIONAL FINANCE CORPORATION will invest $24.4 million in Tanzania Breweries to help the company to increase output and meet international health, safety and environmental standards – World Bank News (June 1). A newly formed NGO, the ECONOMIC AND SOCIAL RESEARCH FOUNDATION (ESRF) will conduct at least six studies by the end of next year on the effects of the stabilisation and structural adjustment programmes on Tanzania’s policy reform process – East African (April 17). The 27-year old NATIONAL INSURANCE CORPORATION (NIC) increased its gross premium income by 30% in 1994 and made Shs 567 million profit before tax compared with Shs 180 million the year before – Daily News (April 19). TOURIST ARRIVALS last year were 261,395 and earnings totalled $192 million equivalent to 18% of the country’s exports Daily News. The Government collected Shs 9.1 billion in May as IMPORT DUTY, SALES TAX, AND EXCISE DUTY – the highest ever. The World Bank has asked Tanzania to de-regulate its OIL INDUSTRY and to close its oil refinery because it is small and inefficient. The government opposes this and has set up a task force to study the matter – East African (April 24). There are 1,400 government-sponsored students in universities abroad – 600 in Russia and Eastern Europe, 450 in India, 87 in the USA, 53 in China, 33 in Cuba, 11 in Western Europe and 10 in Canada. There were many other students in foreign universities not sponsored by the government. 1,103 students in the Ifakara, Ifunda and Tosamaganga secondary schools had been suspended from 1990 to 1993 but resumed classes after paying Shs 19 million in compensation for damage done. 32 students had been expelled – Minister for Education Professor P Sarungi. A new DRUGS BILL has been passed in Parliament. Drug traffickers will be sentenced to life imprisonment. Between 1986 and 1994 some 20,000 bhang-related offences had occurred; some 930 Tanzanians had been arrested abroad for drug offences. The Education Amendment Bill has set up a new autonomous body – a 10-member Higher Education Accreditation Council – to govern accreditation, grants and admission policies of all institutions of higher learning including any new private institutions which might be set up. There are plans to set up a Christian University in Morogoro – Minister for Science, Technology and Higher Education Ben Mkapa. The Government’s National Land Policy would shortly be the subject of a Bill in parliament. It would spell out citizen’s rights to land, its value and the authority of the President as its sole trustee. The Bill would aim to promote a secure ownership system and equitable distribution Minister of Lands, Housing and Urban Development Edward Lowassa. The buildings previously used by the South African PanAfrican Congress in Bagamoyo will be converted into a secondary school for Masai children in the area. There were now 5 daily and 41 weekly and biweekly newspapers and the government had had to issue warnings to 10 of them for poor professional performance – Minister for Information and Broadcasting Philip Marmo. There was an increase in university enrolment of 2,801 students last year; the University of Dar es Salaam had 1,318, Sokoine university of Agriculture 912, Muhimbili University College of Health Sciences 345, and the Open University 1,544. 339 students were sponsored in foreign universities – Minister for Science, Technology and Higher Education, Benjamin Mkapa. Kenya has blamed the delay on appointing a Secretary-General for the proposed ‘East African cooperation commission’ on ‘misunderstandings with Uganda’ according to Foreign Minister Kalonzo Musyoka. Kenya was unhappy about Uganda’s dealings with Kenyan dissidents opposed to the government of President Moi – East African. There has been a reshuffle of High Commissioners in both Dar es Salaam and London. Mr R Westbrook has left Dar es Salaam for Lisbon and been succeeded by Mr Alan Montgomery (57) from the Philippines who was received in audience by the Queen on June 27th just before taking up his appointment. Mr Ali Mchumo has been posted to represent Tanzania at the UN in Geneva and Tanzania’s new High Commissioner in London is Dr. Abdulkader Shareef from Zanzibar. He was previously Ambassador in Saudi Arabia and knows London well having worked in both the BBC Swahili Service and, as a Lecturer in Islamic Studies at the School of Oriental and African Studies. A new art gallery – the Gallery Bamayo – has opened on the ground floor of the NIC Life House building in Dar es Salaam. The proprietor is Grace Rubambe and the opening exhibition included works by the well-known artists N W Nyanzi, R Anderson, J Katembo, J W Masanja, 0 Mandawa and E Jengo. Prices ranged from $132 to $1,320. The other important gallery in Dar, the Gallery Acacia, has moved to the Hotel Karibu – East African (April 17). An Australian investor has discovered 10 million tons of minable gold reserves in Mara region and his company, East African Gold Mines Ltd. which has already spent $4 million on prospecting, proposes to develop a 40 million dollar mine within two years. The company has recruited over 100 staff and hopes to begin mining in 12 months time. Meanwhile in Kabanga, Kahama District, tests indicate that there are some some 34 million tons of nickel, copper and cobal t. The Kabanga belt which is being explored by BHP of Australia and Sutton Resources of Canada, could become one of the leading sources of nickel and cobalt in the world Business Times. The Alliance airline of the African Joint Airline Services (AJAS) held its inaugural flight from Johannesburg to Dar es Salaam and then to Entebbe on June 30 but immediately ran into teething problems. The first aircraft of the joint airline, in which South Africa has a 40% share, Tanzania 30% and Uganda 30%, almost did not land because of week-long protests from Air Tanzania staff fearful for their jobs. Air Tanzania Corporation is a partner in the Alliance. After urgent court cases and detailed explanation by management, agreement for the airline to operate in Tanzania was achieved. Once again Amnesty International’s Report covering the first six months of 1994 deals with Tanzania in less than a page. And once again most of the cases referred to were in Zanzibar. The CUF party was said to have been repeatedly denied permits to hold public meetings; CUF members had been arrested for short periods and at least two were imprisoned on charges of possessing seditious material. Two men were said to have been sentenced to three month’s imprisonment for possessing an audio-cassette of a public meeting. In March two mainland journalists, Pascal Shija, Editor of the Express and Riaz Gulamani were arrested for 10 hours after an editorial accused the Union government of incompetence. The London Guardian reported on July 8 that Tanzanian authorities had arrested the publisher and editor of a Swahili paper Shaba because of attacks on the government. Amnesty has complained about reports that Burundi and Rwandese refugees were in a few cases being forcibly returned to their countries by Tanzanian security forces. The sudden death in London (from what is believed to have been a stroke) of the controversial former Finance Minister PROFESSOR KIGHOMA MALIMA (57) on August 6 caused a shock in Dar es Salaam as his name had rarely been out of the news headlines for several months, following revelations about serious deficiencies in revenue collection while he had been Finance Minister last year. President Mwinyi subsequently appointed him to the post of Minister for Industries and Commerce. The Professor then announced on June 9 that he had resigned from the government. The next day he was in the news headlines again accusing his successor as Minister of Finance, Lt Col. Kikwete, of being engaged in malicious acts bent on character assassination against him. A week later he announced publicly that he would pay immediately Shs 5.2 million in tax liability which he had incurred on two used cars he had imported from Belgium. Having lost his bid to become a CCM presidential candidate, he then sprang a further surprise when, at a congregation of Muslim workers, he announced his resignation from the CCM. On July 16, in Tabora, he announced that he was joining the National Reconstruction Alliance (NRA) party and was, soon afterwards, chosen as its presidential candidate. Both President Mwinyi and Prime Minister Msuya sent condolences to the family and expressed great sorrow at the news of his death. DR. AMIR HABIB JAMAL died on March 21. He was a senior Minister in every post-independence government up to 1986 and elected as an MP with big majorities in every election from 1958 to 1980. He was Minister of Finance 1965-1972, 1975-77, 1979-80 and 1980-83 and held many other senior positions. Mwalimu Nyerere described him in a moving speech as ‘a person of absolute integrity dedicated to selfless service; he was never a ‘Yes man’; he argued for the measures he felt necessary or opposed others which he felt were mistaken; he groomed for leadership those who worked with him; he was a Tanzanian of whom we can be proud’ (Thank you Naseem and Firoz Manji for this notice – Editor). JUSTICE AUGUSTINO SAIDI who died on April 22 was the first Tanzanian Resident Magistrate and the first Tanzanian to serve as Chief Justice after independence. GERRY FINCH was in Tanzania from 1951 to 1963 and served as a District commissioner in Chunya. Prior to that he was an officer in the King’s African Rifles. He and his wife acted for many years as hosts of the popular annual ‘Tanganyika Reunions’ in London. FREDDY JACKSON served in Tanzania from the late forties until the mid-fifties; he became DC in Handeni and Manyoni. ROBIN (RALPH) ELWELL-SUTTON has died at his home in Provence. He was Headmaster of a number of secondary schools in Tanzania in the 1950’s (Thank you Randal Sadleir for this notice – Ed). GEORGE WARREN SHAW OBE was a former British Council Representative in Tanzania who served also in Yugoslavia, Brazil, Nigeria, Ghana and Germany; he died on the evening of June 6th. Taarab is played for entertainment at weddings and other festive occasions all along the Swahili coast. In Zanzibar music can be classified as one of three main types: muziki wa densi (electric dance band music, heavily influenced by Zairean rumba), ngoma (local performance styles) and taarab. In my experience muziki wa densi does not play a substantial role in the live musical environment of Zanzibar. The music is viewed as a definite importation from the mainland. A much more significant distinction can be made between taarab and ngoma. Ngoma includes all indigenous musical events and styles from the mainland. Ngoma are largely characterised by spectator participation, while taarab, in its narrowest sense, is non-participatory: one would “sit and listen”. We shall see that this distinction between taarab and ngoma becomes less clear as we take into consideration a broader definition of taarab. While evidence exists in oral history for concrete musical cross-over between peoples of the Middle East, India and Zanzibar, Zanzibaris generally agree that taarab was introduced to the mainland from Cairo during the reign of the third Omani sultan, Sultan Barghash bin Said (1870-1888). Around the turn of this century, then, Egyptian music, sung in Arabic, was played in Zanzibar for the entertainment of the sultan and his upper-class guests. At this time, the music of the takht ensemble was most popular in Cairo. The musicians were specialised performers, playing for an audience in a situation similar to the western concert. Separate male and female takht ensembles operated side by side, but during the first decade of this century the music was standardised to feature female solo singers backed by male accompanists on an ensemble including male chorus, a qanun (trapezoidal board zither), ‘ud (short-necked plucked lute), nay (oblique-blown flute), violin and a riqq (tambourine). They performed taqtuqah, short songs with a strophic form and short refrain associated with female takt performance. These songs used colloquial Arabic texts and most often dealt with sentimental themes. Non-traditional influences around the time of World War I gave rise to the increased incorporation of western instruments. By the 1940’s western orchestral and electronic instruments were added. still playing compositions based on the taqtuqah, this music flooded the film and recording industry at least until the 1970’s. The group Akhwani Safaa, formed in 1905, is the epitome of what I term “ideal” taarab. Akhwani Safaa sang exclusively in Arabic until as late as 1955 and has continually modelled its composition, instrumentation and performance practice on music from Cairo as described above. The songs adhere to a formula: instrumental introduction, 3 or 4 verses of 3 or 4 lines with short refrains and a single ‘typical’ taarab rhythm (waltz, rumba etc.) throughout. An Akhwani Safaa event is formal with the orchestra on a stage and the audience, mainly women, seated in rows. Dancing is frowned upon. In 1911 Siti binti Saad, a woman who was set to become a taarab legend, arrived from her village of Fumba in the south of the island. Her remarkable voice is still highly acclaimed. By singing in Swahili, and about everyday life in Zanzibar, Siti binti Saad brought taarab out of the palace and to ordinary Swahili- speaking Zanzibaris. In so doing she broke with Arab-orientated, traditional ideas and models. For many of these people this is where taarab began. Small informal groups of Africans formed to play siti’s songs for recreation and for the entertainment of guests (mainly women) at wedding parties. Initially they accompanied themselves only on two home-made drums (kidumbuka) , but soon, following the expansion of ‘ideal’ orchestras, they came to include the two vindumbak, a sanduku (a single-string tea-chest bass instrument), a violin, a pair of cherewa (coconut shell maracas) and a pair of mkwasa (sticks either beaten together or on a table). Performances are informal and take place outdoors. One of the main criteria for success is the extent to which the musicians can excite the women to dance. Popular taarab songs are performed once from beginning to end. This is followed immediately by a swift change in tempo and an improved text is performed in a mchapuzo (fast section). Kidumbak is characterised by its stylistic and aesthetic associations with African forms. Closely aligned to the kindumbak groups, and an important result of Siti binti Saad’ s inspiration, a large network of women’s taarab groups emerged during the late 1930’s. The first of these already existed as lelemama associations: selfhelp associations for women which also provided a forum for the public performance of song and dance characterised by the traditional Swahili activity of often violently expressed disputation. Women brought to taarab this Swahili tradition and, not playing instruments, they hired kindumbak musicians to accompany them. The style moved further into the public domain and began to be influenced more by local practices than by developments in Egypt. The sentimental themes and romantic metaphors used in ‘ ideal’ taarab songs were replaced with hard-hitting and abusive language. These lyrics have been termed mipasho deriving from the verb kupasha (to cause to get) . With these new lyrics the music was bound to change. Women started to draw on taarab music from Mombasa which was more “up beat”. Soon they began to draw on local ngoma and it is no surprise that the most commonly adopted rhythm is the one performed at unyago, an exclusively female ngoma associated with the instruction of girls during their puberty rites. The girls are taught to dance kiuno a sexually explicit, hip-gyrating dance. Unyago is also performed for recreation at weddings. In these contexts, older, married women dance kiuno in pairs competitively to demonstrate their sexual prowess. Women also dance kiuno in this way in the kindumbak context. Women’s groups are typically smaller than ‘ideal’ orchestras and the orientation is percussive. Women enjoy dancing in the kiuno style at these events, the dress is informal, and mipasho lyrics are prevalent. The emergence of a network of women’s taarab clubs is significant considering that it is they who organise and attend the performances (weddings). Women are therefore in a position to determine the kind of entertainment they want, and they can pressurise musicians into making changes. Most of these changes are manifested through Akhwani Safaa’s current rival group Culture Musical Club (CMC) which was set up by the Department of Culture following the revolution in 1964. It was equipped with a full range of instruments employed in Akhwani Safaa thus entering it into the ‘ideal’ taarab category. Members were from outlying districts, many of whom played kindumbak and for women’s groups, and still do. Due to these experiences CMC musicians have a clearer understanding of what changes women are demanding. The majority of their songs now use mpasho-style lyrics and local rhythms, usually unyango. Today even Akhwani Safaa is performing an increasing number of songs along these new lines. This completes the circle: the ‘Swahili-isations’ brought to early ‘ideal’ taarab by Siti binti Saad in the 1930’s and developed by kindumbak and women’s taarab have filtered back into the ‘ideal’ category. In order to understand taarab music fully from both musical and social viewpoints, it is necessary to consider all forms of taarab including what I have called the ‘ideal’ kidumbak and the women’s network. If only the ‘ideal’ is considered it becomes impossible to explain, for example, how change has come about, or how taarab has become such an important element in the lives of all Zanzibaris. The development of ‘taarab’ over the past century suggests an autonomisation from Arab influences as the music has localised and become identifiable as Zanzibari and Swahili. The Tanzanian Finance Minister arrived in Paris at the end of July to assure the Paris (donors) Club that tax loopholes had been closed and that the country was committed to the reform process. At stake was $1.2 million that Tanzania urgently needs. The government, whose coffers are empty according to the Daily News, has been forced to increase bank borrowing fourfold in 1994. Mr Kikwete said on his return that several donors might soon release funds but other Treasury sources (quoted in the East African) felt that his mission had not been a success and most donors were still withholding aid. It was announced on August 4 that the Government had terminated operations of the Tanzania Housing Bank for what was described as ‘critical deterioration of the financial condition’ of the bank. Depositors accounts were being transferred to the National Bank of Commerce (NBC) and the cooperative and Rural Development Bank. The Government would spend Shs 9 billion to pay depositors, creditors and employees of the defunct bank. Earlier, following a crisis statement from the National Bank of Commerce, the Government announced that it was immediately injecting Shs 11 billion of equity capital, seeking joint venture partnerships with foreign commercial banks for NBC’s international banking services and reducing the bank’s urban branch network. The Bank’s management had stated that it had incurred a loss in 1993/94 and that it had a Substantial portfolio of non-performing loans.